With the start of new month I thought it would both useful and interesting to look at the monthly dollar to cad chart given the extent to which the dollar has fallen against the Loonie in the last 2 months. As you can see above last month ended with a wide spread down bar (no great surprise) closing below all three moving averages and with parity now clearly in our sights. When viewing the daily chart it is often easy to forget the context of the current price range against a longer term timeframe and this is clearly evidenced with the monthly chart. 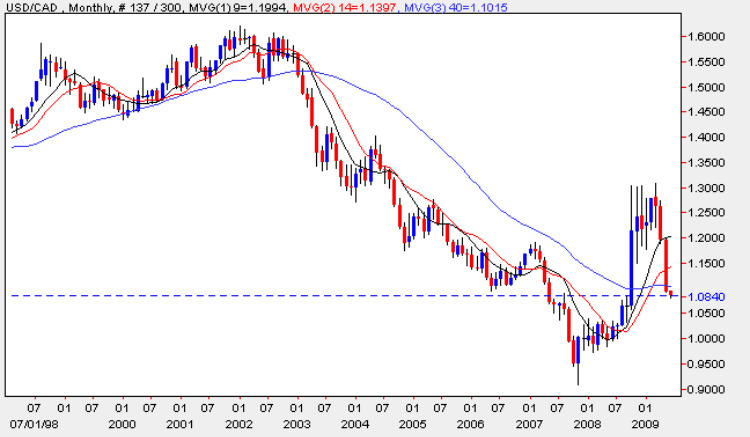 The 1.3 plateau which eventually caused the usd/cad to fall was in fact only half way the previous highs of 1.6, seen back in 2001/2002 and it is often easy to lose sight of this and assume that we are at a top or bottom on the daily chart, so keeping the monthly chart in mind often provides us with a much better and broader perspective of where we are in the overall trading cycle. To bring this up to date, in the last 8 weeks, we are now moving steadily towards an almost inevitably bottoming out either around the parity level or possibly just below, and whilst the bearish trade will be the correct option for the next few weeks, at some point before the end of the year we will see a correction and reversal, simply because this is the way markets work. The Canadian Dollar (along with the Aussie Dollar) has also benefited from investor confidence in the way the respective governments and central banks have handled the current financial turmoil. The principal fundamental news on the economic calendar for the Canadian dollar was the release of the GDP figures which came out on target at -0.3%, followed by the RMPI and IPPI numbers which both came out worse than expected at -0.5% against a forecast of 6.2% for the former and 0.2% for the latter. In the meantime you can catch up with all the US data on the eurodollar site.